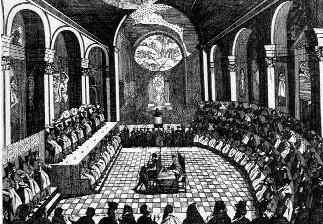 A session of the Council of Trent, from an engraving. Ecumenical councils are different from provincial councils, where bishops of a Church province or region meet. Episcopal conferences and plenary councils are other bodies, meetings of bishops of one country, nation, or region, such as the United States Conference of Catholic Bishops. This article does not include councils of a lower order or regional councils. Ecumenical in the Catholic view does not mean that all bishops attended the councils, which was not even the case in Vatican II. Nor does ecumenical imply the participation of or acceptance by all Christian communities and Churches. Ecumenical refers to "a solemn congregations of the Catholic bishops of the world at the invitation of the Pope to decide on matters of the Church with him". The ecumenical character of the councils of the first millennium was not determined by the intention of those who issued the invitations. The papal approval of the early councils did not have a formal character, which was characteristic in later councils. The Catholic Church did not officially declare these councils to be ecumenical. This became theological practice. Different evaluations existed between and within Christian communities. Today 21 councils are accepted in the Catholic church as ecumenical councils. Not all of the twenty-one councils were always accepted as ecumenical within the Catholic Church. For example, the inclusion of the First Lateran Council and the Council of Basel were disputed. A 1539 book on ecumenical councils by Cardinal Dominicus Jacobazzi excluded them as did other scholars. The first few centuries did not know large-scale ecumenical meetings; they were only feasible after the Church had gained freedom from persecution through Emperor Constantine. There is a sole meeting of the early Christian Church the New Testament period which has been generally regarded as a council and which is included in the traditional Catholic reckoning as the first of the ecumenical councils, whereas other denominations usually count the First Council of Nicaea as such. The Council of Jerusalem or Apostolic Council was held in Jerusalem around AD 50. It is unique among the ancient pre-ecumenical councils in that it is considered by Catholics to be the first ecumenical council and by Orthodox to be a prototype and forerunner of the later ecumenical councils. Both Catholics and Orthodox regard it as expressing a key part of Christian doctrine and moral teaching. The Council decided that Gentile converts to Christianity were not obligated to keep most of the Law of Moses, including the rules concerning circumcision of males. The Council did, however, arguably retain prohibitions on eating meat sacrificed in pagan rites, on fornication and on idolatry. These decisions are sometimes referred to as the Apostolic Decree. The prime account of the Council is found in Acts of the Apostles chapter 15. These comprised the hierarchs of the undivided Church (i.e. both East and West), and, excepting the Fourth Council of Constantinople, are recognised as ecumenical councils also by the modern Eastern Orthodox Church. The First Council of Nicaea (May 20 – July 25?, 325) formulated the original Nicene Creed. Most importantly, the Council defined the equality of God the Father and Christ, his son. It taught that Jesus was of the same substance as God the Father and not just merely similar. By defining the nature of the divinity of Jesus, the Council did not solely rely on the Bible but jointly gave it a binding interpretation. The Council issued 20 canons and repudiated Arianism. The First Council of Constantinople defined in four canons the Nicene Creed, which is still used in the Catholic Church. Most importantly, it defined the divinity of the Holy Spirit, which is derived but not defined in the Bible. Thus the Council built on the Apostolic Tradition. The Council met from May until July 381 during the pontificate of Pope Damasus I and issued four canons. The Council of Ephesus proclaimed the Virgin Mary as the Theotokos (Greek Η Θεοτόκος, "Mother of God"). The Council met in seven sessions during the pontificate of Pope Celestine I from June 22 until July 17, 431. It rejected Nestorianism. The Council of Chalcedon defined the two natures (divine and human) of Jesus Christ. “We teach unanimously that the one son, our lord Jesus Christ to be fully God and fully human." It met in 17 sessions from October 8 until November 451 during the pontificate of Pope Leo the Great. It issued 28 canons, the last one defining equality of the bishops of Rome and Constantinople, which was rejected by the papal delegates and Pope Leo the Great, and therefore not binding for the Catholic Church. The Council again dealt with the issue of the two natures of Christ, as monophysitism had spread through Christianity despite the decisions of Chalcedon. The Council met from May 5 until June 2, 553, in eight sessions during the pontificate of Pope Vigilius, who was imprisoned during the Council by the emperor. It condemned "Three Chapters" of Nestorian writings. Several Catholic provinces refused to accept the Second Council of Constantinople because of the political pressures. The Council repudiated Monothelitism, and reaffirmed that Christ, being both human and divine, had both human and divine wills. It met in sixteen sessions from November 7, 680, until September 16, 681. The Council was held during the pontificates of Pope Agatho and Pope Leo II. It also discussed the views of Honorius. In 730, the emperor outlawed pictorial presentations of Christ and the saints and created thus the first iconoclasm. The Pope argued against it and convened in 731 a local council in Rome to no avail. The Council discussed and restored the veneration of icons using the Bible and tradition of the Church as arguments. Pictures of Christ, the Blessed Virgin Mary and the Saints were used to stimulate piety and imitation. The Council met in eight sessions from September 24, 787, until October 23, 787, during the pontificate of Pope Hadrian I. It issued twenty canons. This was the last ecumenical council to be accepted by both Eastern and Western churches. With the coronation of Charlemagne by Pope Leo III in 800, his new title as Patricius Romanorum, and the handing over of the keys to the Tomb of Saint Peter, the papacy had acquired a new protector in the West. This freed the pontiffs to some degree from the power of the emperor in Constantinople, but it also led to a schism, because the emperors and patriarchs of Constantinople interpreted themselves as the true descendants of the Roman Empire dating back to the beginnings of the Church. Pope Nicholas I had refused to recognize Patriarch Photios I of Constantinople, who in turn had attacked the pope as a heretic, because he kept the filioque in the creed, which referred to the Holy Spirit emanating from God the Father and the Son. The Council condemned Photius, who questioned the legality of the papal delegates presiding over the Council, and ended the schism. The Council met in ten sessions from October 869 to February 870 and issued 27 canons. Successors of Charlemagne insisted increasingly on the right to appoint bishops on their own, which led to the Investiture Controversy with the popes. The Concordat of Worms signed by Pope Calixtus II included a compromise between the two parties, by which the pope alone appoints bishops as spiritual head while the emperor maintains a right to give secular offices and honors. Pope Calixtus invoked the Council to ratify this historic agreement. There are few documents and protocols left from the sessions and 25 canons approved. The Council met from March 18 to April 5, 1123. After the death of Pope Honorius II (1124–1130), two popes were elected by two groups of cardinals. Sixteen cardinals elected Pope Innocent II, while others elected Antipope Anacletus II who was called the Pope of the Ghetto, in light of his Jewish origins. The Council deposed the antipope and his followers. In important decisions regarding the celibacy of Catholic priests, clerical marriages of priests and monks, which up to 1139 were considered illegal, were defined and declared as non-existing and invalid. The Council met under Pope Innocent II in April 1139 and issued 30 canons. The Council established the two-third majority necessary for the election of a pope. This two-third majority existed until Pope John Paul II. His change was reverted to the old two-third majority by Pope Benedict XVI in his Moto Proprio, De Aliquibus Mutationibus, from June 11, 2007. Still valid today are the regulations that outlawed simony, and the elevation to Episcopal offices for anyone under thirty. The Council also ruled it illegal to sell arms or goods which could assist armaments to Muslim powers. Saracens and Jews were forbidden from keeping Christian slaves. All cathedrals were to appoint teachers for indigent and low-income children. Catharism was condemned as a heresy. This Council is well documented: Reports include the saga of an Irish bishop whose income consisted in the milk from three cows. If one of the cows would stop giving milk, the faithful were obliged to donate another animal. The Council met in March 1179 in three sessions and issued 27 chapters, which were all approved by Pope Alexander III. The Council mandated every Christian in serious sin is to go at least once a year on Easter to confession and to receive the Holy Eucharist. The Council formally repeated Catholic teaching, that Christ is present in the Eucharist and thus clarified transubstantiation. It dealt with several heresies without naming names but intended to include the Catharists and several individual Catholic theologians. It made several political rulings as well. It met in only three sessions in November 1215 under Pope Innocent III and issued 70 chapters. The Council continued the political rulings of the previous council by deposing Frederick II, as German king and as emperor. Frederick was accused of heresy, treason and arresting a ship with about 100 prelates willing to attend a meeting with the Pope. Frederick outlawed attendance at the Council and blocked access to Lyon from Germany. Therefore, the majority of Council fathers originated from Spain, France and Italy. The Council met in three sessions from June 28, 1245, and issued 22 chapters all approved by Pope Innocent IV. Pope Gregory X defined three aims for the Council: aid to Jerusalem, union with the Greek Orthodox Church and reform of the Catholic Church. The Council achieved a short-lived unity with the Greek representatives, who were denounced for this back home by the hierarchy and the emperor. Papal conclaves were regulated in Ubi periculum, which specified that electors must be locked up during the conclave and, if they could not agree on a pope after eight days, would receive water and bread only. Franciscan, Dominican, and other orders had become controversial in light of their increasing popularity. The Council confirmed their privileges. Pope Gregory X approved all 31 chapters, after modifying some of them, thus clearly indicating papal prerogatives. The Council met in six sessions from May 7 to July 17, 1274, under his leadership. Pope Clement V solemnly opened the Council with a liturgy, which has been repeated since in all Catholic ecumenical councils. He entered the Cathedral in liturgical vestments with a small procession and took his place on the papal throne. Patriarchs, followed by cardinals, archbishops and bishops, were the next in rank. The Pope gave a blessing to the choir, which intoned the Veni Sancte Spiritus. The Pope issued a prayer to the Holy Spirit, the litany of saints was recited and only after additional prayer did the Pope actually address the Council and open it formally. He mentioned four topics, the Order of Knights Templar, the regaining of the Holy Land, a reform of public morality and freedom for the Church. Pope Clement had asked the bishops to list all their problems with the order. The Templars had become an obstacle to many bishops because they could act independently of them in such vital areas as filling parishes and other positions. Many accusations against the order were not accepted as the Pope ruled that confessions under torture were inadmissible. He withdrew canonical support for the order but refused to turn over its properties to the French king. The Council fathers discussed another crusade, but were convinced instead by Raimundus Lullus that knowledge of foreign languages is the only way to Christianize Muslims and Jews. He successfully proposed the teaching of Greek, Hebrew, and Arabic languages in Catholic universities. With this the Council is considered to have begun modern missionary policies. In the three sessions, the Council discussed further Franciscan poverty ideals. It met from October 1311 until May 1312. The following councils in Constance, Basel, Ferrara, Florence witnessed an ongoing debate regarding the superiority of the papacy over ecumenical councils. At the beginning of the Council there was the great schism, with three popes, each claiming legitimacy. One of them, John XXIII, called for the Council to take place in Konstance, Germany, hoping to get additional legitimation from the Council. When public opinion moved against him in March 1415, he fled to Schaffhausen and went into hiding in several Black Forest villages such as Saig. After his flight, the Council issued the famous declaration Sacrosancta, which declared that any pope is below, not above, an ecumenical council. The Council deposed all three popes and installed Pope Martin V, who made his peace with John XXIII by installing him as a cardinal. Reforms did not materialize as hoped for, because the reformers disagreed among themselves. John Hus, a Bohemian reformer, was issued an imperial guarantee for safe conduct forth and back. The Church did not revoke its suspension to say Mass and preach in public. When Hus did just that, he was arrested and tried for heresy. Turned over to State authorities, he was burned at the stake in 1415. The Council of Constance was one of the longest lasting in Church history. The influx of 15,000 to 20,000 persons into the medieval city of 10,000 created inflation of unknown proportions. The German poet Oswald von Wolkenstein wrote: Just thinking of Constance, my purse begins to hurt. The Council addressed the future councils to be held and signed five concordats with the major participating nations. The Council met in 45 sessions from November 4, 1414, until April 22, 1418. The Council continued debate on conciliarism. The papal delegate opened the Council in Basel on July 23, 1431, without a single bishop present. When he tried to close it later, bishops insisted on citing the pope to the Council, which he refused. The Council continued on its own and issued several decrees on Church reform. Most of the participants were theologians; bishops made only ten percent of the eligible voters. The Pope moved the Council to Ferrara, where he achieved a major success, when the Greek Orthodox Church agreed to unity with Rome. But conciliarism continued to be the politically correct trend, as “reform” and “council” were seen as inseparable. Formally, the Council of Basel was never closed. The Council decreed in 1439 (a short-lived) union with Greek, Armenian, and Jacobite Churches (1442). The Council had 25 sessions from July 1431 until April 1442. It met under Pope Eugene IV in Basel, Germany, and Ferrara and Florence Italy. It was moved to Rome in 1442. The Fifth Council of the Lateran opened under the leadership of the Pope in Rome. It taught that the soul of a human being lives forever (but see the current understanding of eternal life). As previous councils, it condemned heresies stating the opposite without mentioning names. The opening sermon included the sentence: "People must be transformed by holiness not holiness by the people." The issue was reform and numerous small reforms were approved by the Council, such as selection of bishops, taxation issues, religious education, training of priests, improved sermons, etc., but the larger issues were not covered and Pope Leo X was not particularly reform-minded. The Council condemned as illegal a previous meeting in Pisa. The Council met from 1512–1517 in twelve sessions under Pope Julius II and his successor Pope Leo X. The Council issued condemnations on what it defined as Protestant heresies and it defined Church teachings in the areas of Scripture and Tradition, Original Sin, Justification, Sacraments, the Eucharist in Holy Mass and the veneration of saints. It issued numerous reform decrees. By specifying Catholic doctrine on salvation, the sacraments, and the Biblical canon, the Council was answering Protestant disputes. The Council entrusted to the Pope the implementation of its work, as a result of which Pope Pius V issued in 1566 the Roman Catechism, in 1568 a revised Roman Breviary, and in 1570 a revised Roman Missal, thus initiating the Tridentine Mass (from Trent's Latin name Tridentum), and Pope Clement VIII issued in 1592 a revised edition of the Vulgate. The Council of Trent is considered one of the most successful councils in the history of the Catholic Church, firming up Catholic belief as understood at the time, leading to the introduction of catechisms to strengthen this belief. It convened in Trent between December 13, 1545, and December 4, 1563, in twenty-five sessions for three periods. Council Fathers met for the 1st–8th sessions in Trent (1545–1547) and for the 9th–11th sessions in Bologna (1547) during the pontificate of Pope Paul III. Under Pope Julius III, the Council met in Trent (1551–1552) for the 12th–16th sessions. Under Pope Pius IV the 17th–25th sessions took place in Trent (1559–1565). The Council was convened by Pope Pius IX in 1869 and had to be prematurely interrupted in 1870 because of advancing Italian troops. In the short time, it issued definitions of the Catholic faith, the papacy and papal infallibility. Many issues remained incomplete, such as a definition of the Church and the authority of the bishops. Many French Catholics desired the dogmatization of and the assumption of Mary in the ecumenical council. During Vatican One, nine mariological petitions favoured a possible assumption dogma, which however was strongly opposed by some council fathers, especially from Germany. On May 8, the fathers rejected a dogmatization at that time, a rejection shared by Pope Pius IX. The concept of co-redemptrix was also discussed but left open. In its support, Council fathers highlighted the divine motherhood of Mary and called her the mother of all graces. But by the time of Vatican II it was passed over for reasons given and later avoided because of its ambiguity. The Council met in four sessions from December 8, 1869, to July 18, 1870. The Second Vatican Council was invoked by Pope John XXIII. It met from 1962 to 1965. Unlike most previous councils, this one did not discuss heresy, as its orientation was mainly pastoral; The Council issued "constitutions" on restoration of liturgical ritual "according to the pristine norm of the Fathers", on the nature of the Church and also on its relation to the modern world, and on promotion of Scripture and Biblical studies. It issued "declarations" on education, on non-Christian religions, and its most contentious decree on religious liberty. Nine additional "decrees" covered the topics of the mission activity of he church, the ministry and life of priests and priestly training, the apostolate of the laity, the renewal of religious life, the pastoral office of bishops, ecumenism, Catholic churches of the Eastern Rite, and media and social communications. The general sessions of the Council were held in the autumns of four successive years (in four periods) 1962 through 1965. During the other parts of the year special commissions met to review and collate the work of the bishops and to prepare for the next session. 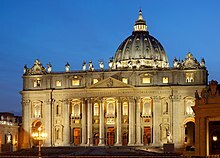 Sessions were held in Latin in St. Peter's Basilica, with secrecy kept as to discussions held and opinions expressed. Speeches (called interventions) were limited to ten minutes. Much of the work of the Council, though, went on in a variety of other commission meetings (which could be held in other languages), as well as diverse informal meetings and social contacts outside of the Council proper. Two-thousand nine-hundred and eight (2,908) men (referred to as Council Fathers) were entitled to seats at the Council. These included all bishops from around the world, as well as many superiors of male religious orders. In the opening session 2,540 took part, making it the largest gathering in any council in church history. (This contrasts with Vatican I where 737 attended, mostly from Europe.) Attendance varied in later sessions from 2,100 to over 2,300. In addition, a varying number of periti (Latin for "experts") were available for theological consultation—a group that turned out to have a major influence as the Council went forward. Seventeen Orthodox Churches and Protestant denominations sent observers. More than three dozen representatives of other Christian communities were present at the opening session, and the number grew to nearly a hundred by the end of the 4th Council Session. ^ "The 21 Ecumenical Councils". Catholic Answers. Retrieved 2019-04-16. ^ "CATHOLIC LIBRARY: The 21 Ecumenical Councils". www.newadvent.org. Retrieved 2019-04-16. ^ canonlawmadeeasy (2009-04-02). "Is Confession Still an Easter Duty?". Canon Law Made Easy. Retrieved 2019-04-16. ^ "CCC Search Result - Paragraph # 1472". www.scborromeo.org. Retrieved 2019-04-16. ^ Civilta Catolica February 6, 1869. ^ Lumen Gentium, 60, 62. ^ "THÔNG BÁO THAY ĐỔI TÊN DÒNG – DÒNG MẸ CHÚA CỨU CHUỘC – CRM – TỈNH DÒNG ĐỒNG CÔNG HOA KỲ". dongcong.us. Retrieved 2019-04-16. ^ "Sacrosanctum concilium". www.vatican.va. Retrieved 2019-04-16. ^ "Lumen gentium". www.vatican.va. Retrieved 2019-04-16. ^ "Pastoral Constitution on the Church in the Modern Word-Gaudium et Spes". www.vatican.va. Retrieved 2019-04-16. ^ "Dei verbum". www.vatican.va. Retrieved 2019-04-16. ^ "Gravissimum educationis". www.vatican.va. Retrieved 2019-04-16. ^ "Nostra aetate". www.vatican.va. Retrieved 2019-04-16. ^ "Dignitatis humanae". www.vatican.va. Retrieved 2019-04-16. ^ "Pope Benedict XVI and Religious Liberty. Separating Fact from Fiction, Introvigne". www.cesnur.org. Retrieved 2019-04-16. ^ "Ad gentes". www.vatican.va. Retrieved 2019-04-16. ^ "Presbyterorum ordinis". www.vatican.va. Retrieved 2019-04-16. ^ "Optatam totius". www.vatican.va. Retrieved 2019-04-16. ^ "Apostolicam actuositatem". www.vatican.va. Retrieved 2019-04-16. ^ "Perfectae caritatis". www.vatican.va. Retrieved 2019-04-16. ^ "Christus dominus". www.vatican.va. Retrieved 2019-04-16. ^ "Unitatis redintegratio". www.vatican.va. Retrieved 2019-04-16. ^ "Orientalium ecclesiarium". www.vatican.va. Retrieved 2019-04-16. ^ "Inter mirifica". www.vatican.va. Retrieved 2019-04-16. This page was last edited on 16 April 2019, at 20:24 (UTC).